Last night Mina and I went to Desnuda because she had a huge ceviche craving. The food was delicious, but don’t go there if you are very hungry and expecting to eat right away! I had a hard time finding this cozy spot as there isn’t really any signage outside and the entrance is almost not even visible, but it is definitely a hidden gem. All of the food is prepared directly behind the bar by the chef/bartender, and his sous chef/waiter is right there with him, but it is just the two of them. Because of this, and the fact that everything is made fresh as you order it, things do take time to be served, and are about 15 or so seats there, so it is a lot for just two guys. I would recommend going here if you want to relax, have a nice glass of wine and some delicious fresh food. But this is not a place to go for a quick in and out bite. I wouldn’t quite call every dish here ceviche as ceviche is really fish that is cured with some sort of citrus, and some of the dishes here are really what I would call sashimi etc. But call it what you want, it is all very good. Here are some of the dishes we enjoyed here. 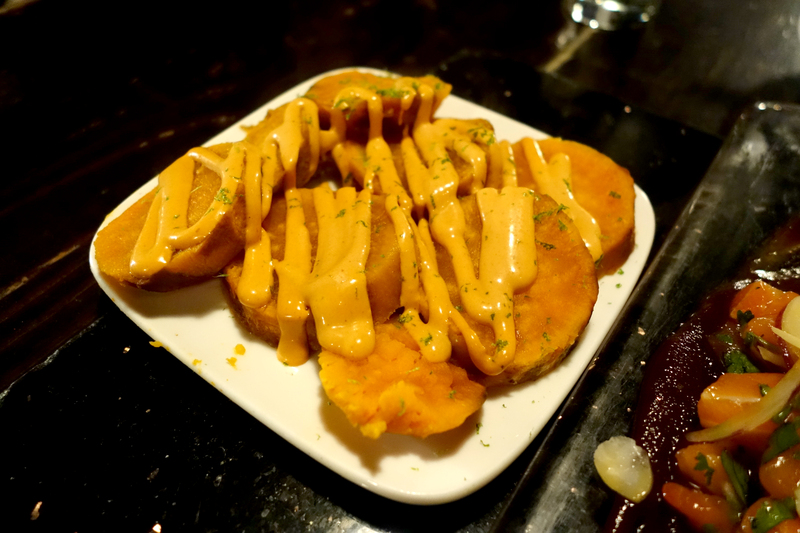 Desnuda NYC – Sweet potato with Panca aioli – the flavor was good, but this was my least favorite dish. I would pass on ordering this. 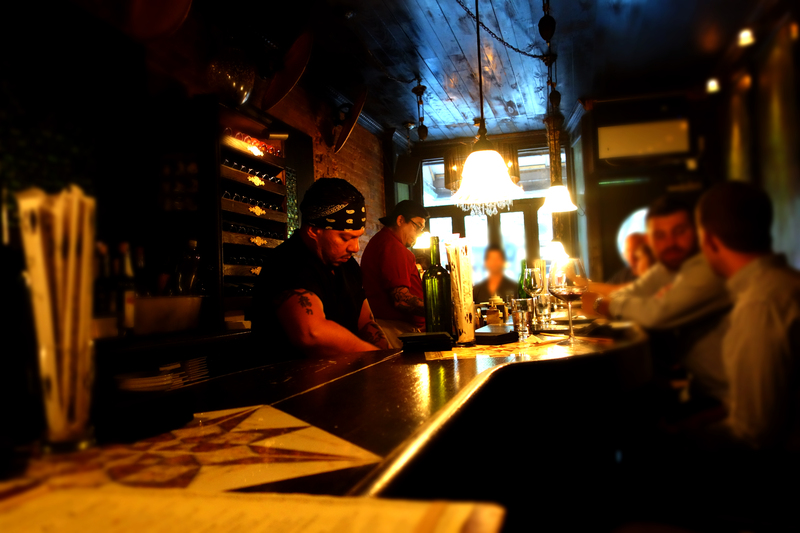 The wine bar/ cevicheria is located at 122 E 7th St, NYC 10009. Contact them at 212-254-3515 and visit their website at http://www.desnudany.com/main.php (not really mobile friendly). 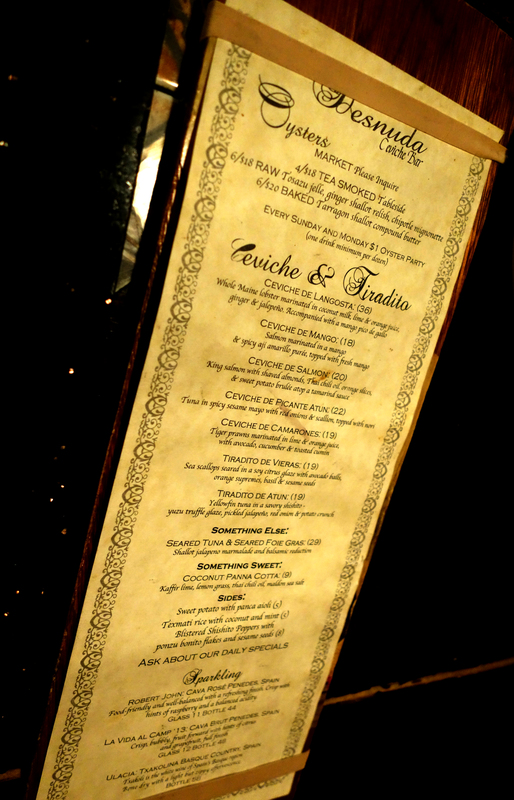 Here is a view of their current menu. 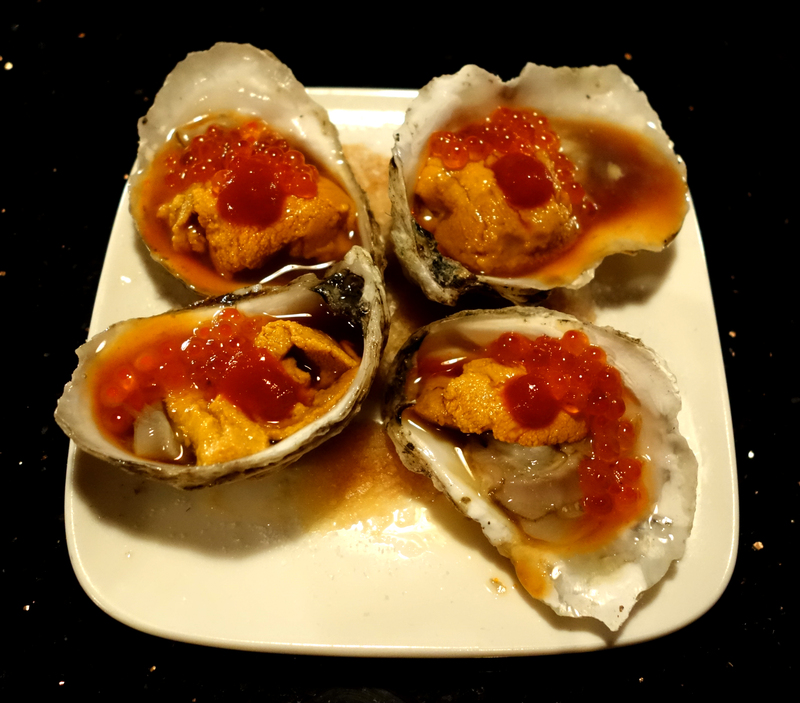 My only callout is that I think it is awesome that they smoke oysters bar-side, and with a bong at that….but it is a small place so it is a little overwhelming for the rest of the patrons. I hope they invest in an exhaust system so not everyone is eating the smoke in the air when one person in the place orders them, and this is coming from someone who actually likes smoke. After dinner Mina said that I MUST try ChikaLicous – The Dessert Club. I am so glad I grabbed some stuff here and brought them home to split with Luis. I got a Bunker Hill Boston Crème crème puff, a Tahitian Crème Brulée Crème puff, and a Crème Brulée Dough’ssant. 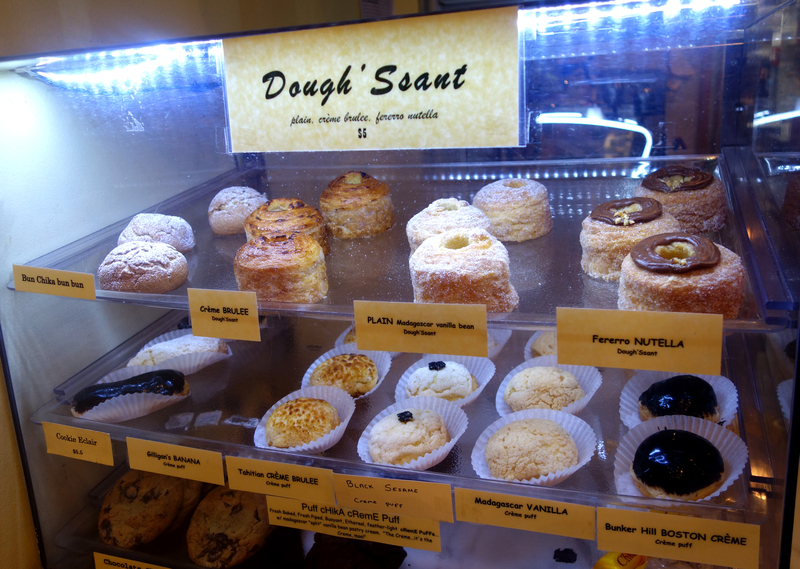 All of them were delicious, but the Dough’ssant was AMAZING. I didn’t even imagine it was going to be as good as it was. Next time I pass by I really want to try some of their mochi, like the tiramisu or key lime pie ones! Yum. 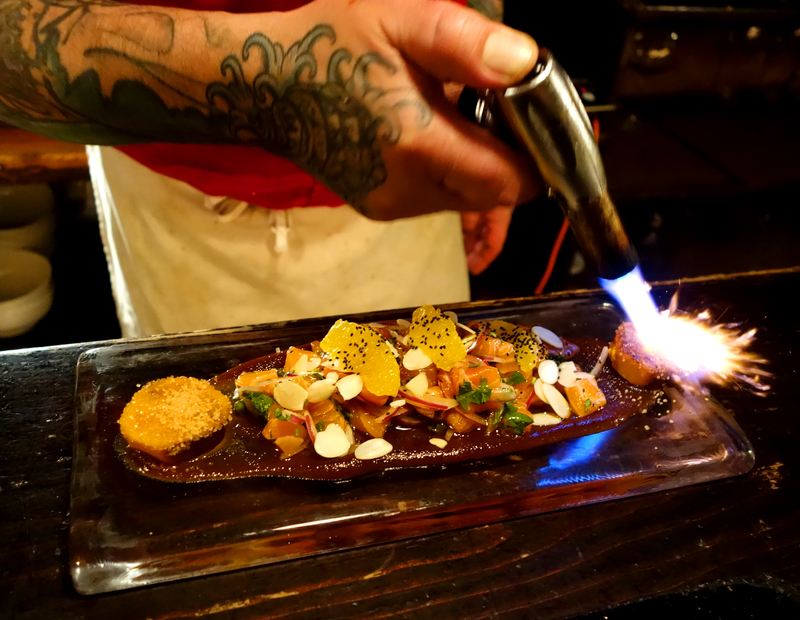 Chikalicious NYC – some delicious desserts on display. That crème brulée dough’ssant though… wow. 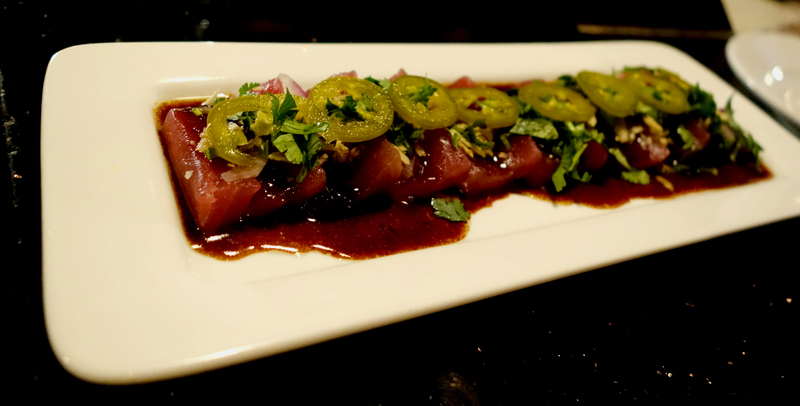 Jaye’s Food and Travels Blog is opening up a new world here!